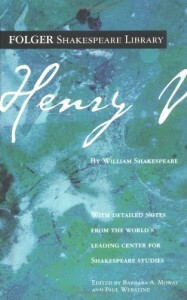 Henry V is Shakespeare's war play. While he often has wars in plays this plays focus is on war and also on Kingship. Shakespeare has always been interested in Kingship and is primarily interested in the character of Kings and what makes a good and bad King. To the extent that he has any political opinion, it is that usurpers are bad, which is not unreasonable given that they tend to trigger civil wars. In Henry V, King Henry is represented as an ideal King, but that representation happens within the context of war. The civil duties of Kingship are not much touched upon. Further, while Shakespeare does talk about the horrors war, his focus is on the glory. It feels less deep than most Shakespearean treatments. While he captures perfectly the camaraderie of soldiers, which is why it has become the most referenced source of quotations on this. It none-the-less in the end feels one sided. There are apparently deconstructionist readings that focus on finding tensions in the heroism and personality of King Harry, but I think that those are illegitimate readings. The King Harry of King Henry V, betrays the rascals of his youth, and while Shakespeare may well be right that a King should not tolerate that kind of behaviour, it sits uneasily because Shakespeare spent the two King Henry IV plays making those rascals adorable. In short what is bad about King Henry V is that it is considerably shallower than one would expect. Furthermore, unlike the two King Henry IVs the comedy and the serious scenes jar against one another and are not well integrated. Having pointed to King Henry V's weaknesses which are surprising, I now want to point out its strengths. The language is Shakespeare and the actual construction of that language is as least as good as average for Shakespeare which means of course that it is amazing, brilliant and beautiful. Furthermore, the play contains many excellent scenes. I thought that I had never read or seen King Henry V, but in fact I had seen a production as a child and as I read the play many of those scenes emerged from my memory vividly as I saw them almost forty years ago. In particular, the scene with King Henry wandering the army camp before the battle of Agincourt, the scene mostly in French with Katherine and her lady in waiting and the Leek eating scene (which apparently made a great impression on my childhood self) are outstanding. I'm left then with strongly mixed feelings about King Henry V and cannot put it amongst the best of Shakespeare's plays. It is clearly inferior to the King Henry IVs, but it contains many elements of genius. It is a play where the whole is less than the sum of the parts. That might seem harsh for what is still clearly a work of genius, but because it's Shakespeare my expectations were raised a bit.